Thunderbolt technology is what was Intel's Light Peak. It's not an Apple technology, but rather the culmination of Intel's handiwork in combination with Apple's mini DisplayPort. 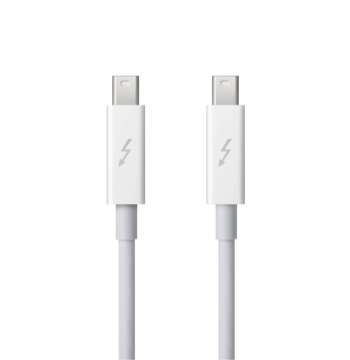 While Light Peak was developed to work over fiber (literally for light speeds), Thunderbolt is implemented over copper. Despite this, you're still getting bi-directional (in and out as they say), 10 Gbps connection over a cable, plus a 10 Watt feed so you can power heavy equipment on the go (you don't get that with USB). For comparison, your current USB 2.0 devices only get 480 Mbps through the cable! With this technology, you can drive multiple inputs including monitors, workstations, and audio equipment without a bird's nest under your desk. Thunderbolt allows users to connect to monitors sport mini DisplayPort, or DisplayPort connections. Adapters can allow for HDMI, DVI, and VGA connections as well, but it doesn't stop with these less ambitious technologies. Thunderbolt provides support for optical connections (you heard me: FIBER), to connect to high speed networks. It's kind of insane to think about: USB 3.0 provides plug & play connections at up to 5 Gbps, yet Thunderbolt can accommodate almost any technology and possibly power a business out of a laptop. Apple and Intel are very much pushing the envelope here. Don't worry about those silly terms above. Just think of it this way - data can go in & out of the cable at the same time with no waiting. Otherwise, Thunderbolt separates your display and data connections by passing your monitor input through DisplayPort, while your data is passed through the PCI Express bus. Thunderbolt is the combination of monitor and data technologies. For the consumer, the best part is simply this: you'll no longer have multiple Cinema Display cables hooking to your laptop. You can still latch on your hard drives, USB sticks, and iPhone docks to your display, but because there's such a huge amount of bandwidth with Thunderbolt, it can effortlessly slurp down one cable. Keep in mind that Thunderbolt is both giving the user display feedback, as well as shuffling bits of data around for files and music all in one tube. The idea itself isn't new, but customer accessibility (especially in the Apple ecosystem) will simplify installation. You may not necessarily see a hard drive instantly fill up if there's a USB connection in the middle somewhere (there would be a bottleneck at the Cinema Display for example), but the current generation of SATA III HDDs can gobble down data at 6 Gbps. Imagine if that was directly paired with Thunderbolt with or without an adapter, then plugged into your machine? It wouldn't take long at all to clone your HDD or transfer a media center's worth of files somewhere else. What if I have more than one Thunderbolt device? The cool part about Thunderbolt is that you can "daisy-chain" devices. So say you connect your MacBook to a Thunderbolt enabled external hard drive, but want to plug in another external hard drive via the same port. Well, instead of connecting to the MacBook, you'll just connection to a second Thunderbolt port on your first external hard drive. Make sense? The connection will pass through subsequent devices until it reaches your Mac, but it will be instant. Cool! So... are there any Thunderbolt devices yet? Not yet, but Thunderbolt is extensible. You can use the port for Gigabit Ethernet, FireWire, or even eSATA via adapters that will show up on the market. Ever wanted a fast eSATA connection to your Mac? Well now you can use those existing drives from your PC with your Mac in the near future. 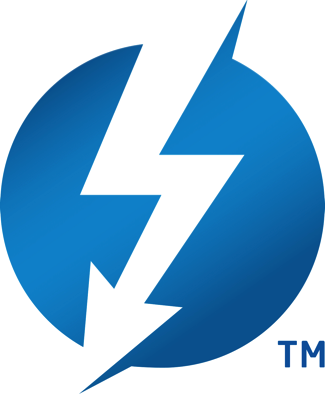 There's a lot of performance to be had in Thunderbolt, and Intel is making sure it'll soon be incorporated in PCs, audio equipment, video devices, and high speed storage equipment. We tried to provide a basic understanding of the forces at play for consumer wondering what the hubbub is about. For more information, see Apple's landing page at Apple.com/thunderbolt, and Intel's brief at their technology page.